Julianna's birthday party was this past Monday (Memorial day) and we had fun! 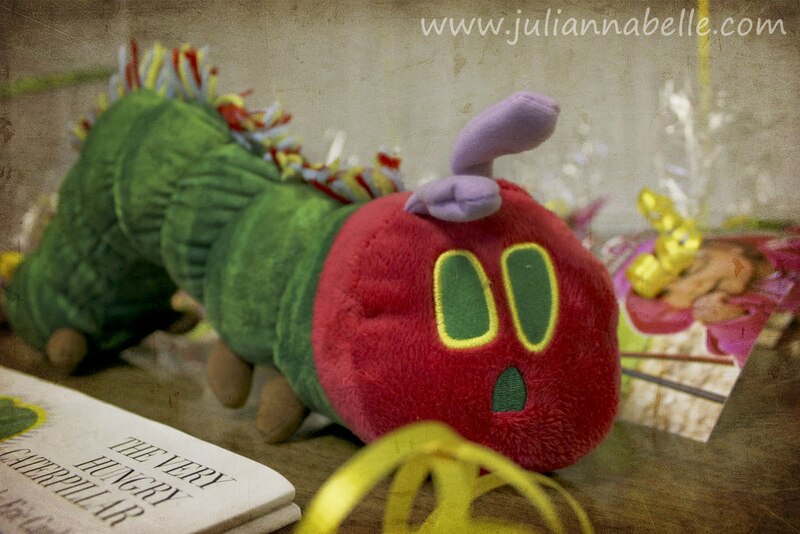 The theme for Julianna's party was the Very Hungry Caterpillar. I spent a lot of time researching and prepping for the party and I think it paid off. Everyone seemed to really like the theme (or they were being nice & said they liked it lol). 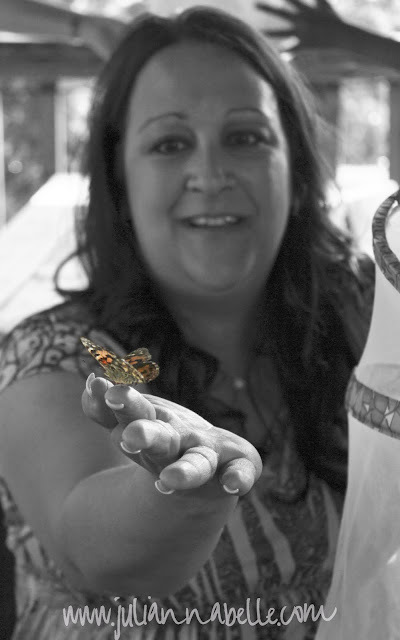 For those of you wondering about the butterflies - they lived! Monday was a long day (actually the whole weekend was long prepping for the party). We arrived at the Firehouse rental hall around 9am setting up the party ... and then the party started at 1pm ... and mostly everyone stayed until 3:30 or 4. We had quite the cleanup afterwards. It was a fun day but I'll say this - we are not doing it next year. I would rather just pay someone to cater & clean up next time. 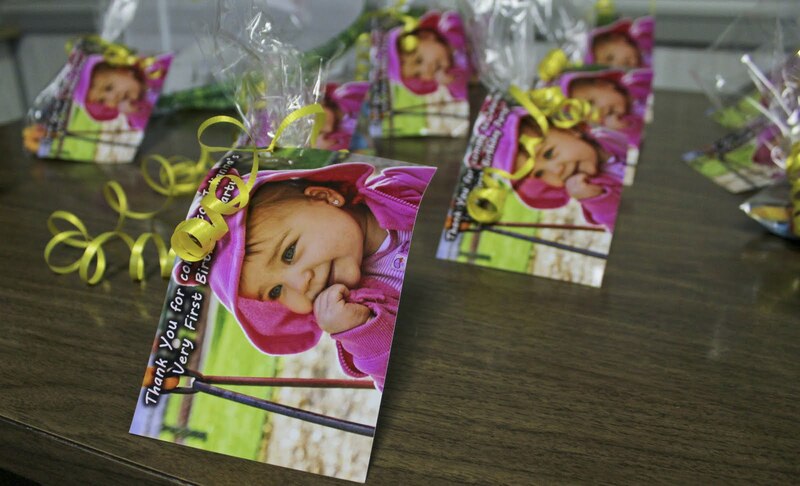 It was a lot of work bur was totally worth it because Julianna only turns one once! It was 90 degrees & humid so we did not get to really play the badminton or horseshoes like we had hoped for. The kids got to put on butterfly tattoos, colored in butterfly coloring books, played with balloons & bubbles... and they made Hungry Caterpillar thumbprint bookmarks. We had story time - What book do you think I read? Yep you guessed it - the Very Hungry Caterpillar! 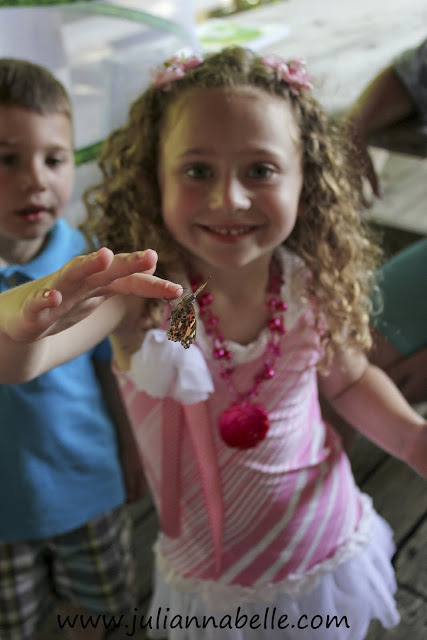 And then we released the butterflies! The kids loved that. I will say this too... I should have taken more pictures. I realized I did not take any good pictures of family and friends ... or of us with Julianna... or of the food... and the list goes on. I need to make a photo checklist next time so I don't forget to take the obvious ones! See the butterfly house in the back left corner... they were alive and ready to be free! I did a 12 month collage - 1 picture to celebrate each month of Julianna's first year! 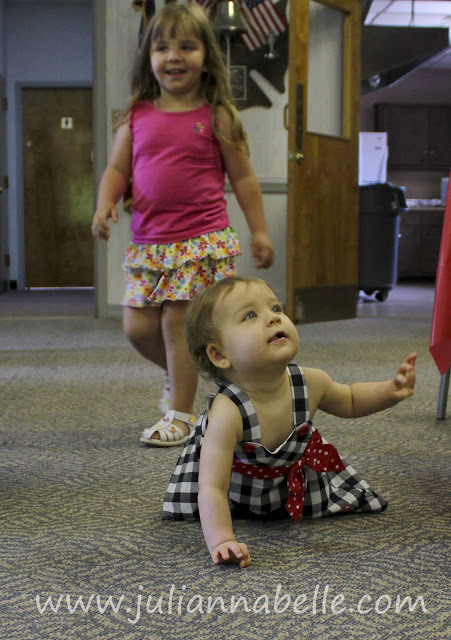 Julianna & Maya checking out the floor of the hall. Julianna still checking out the situation. She was really shy in the beginning and a bit overwhelmed with all the people. Story time. 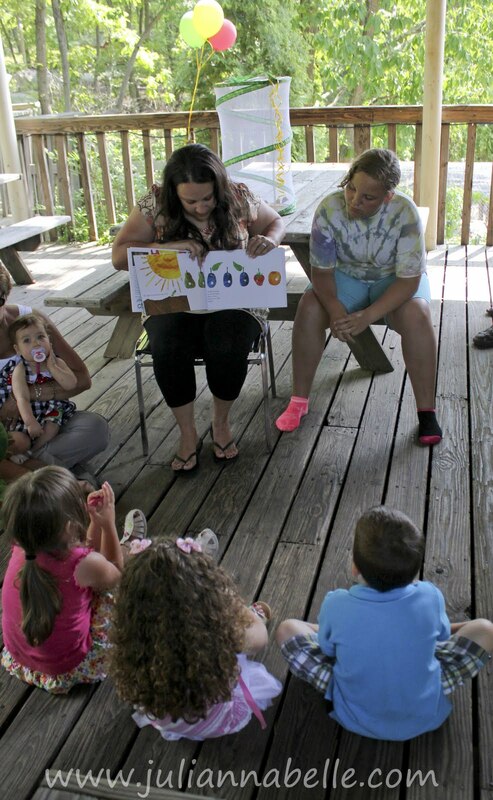 That's me reading "The Very Hungry Caterpillar" to the kids & adults. 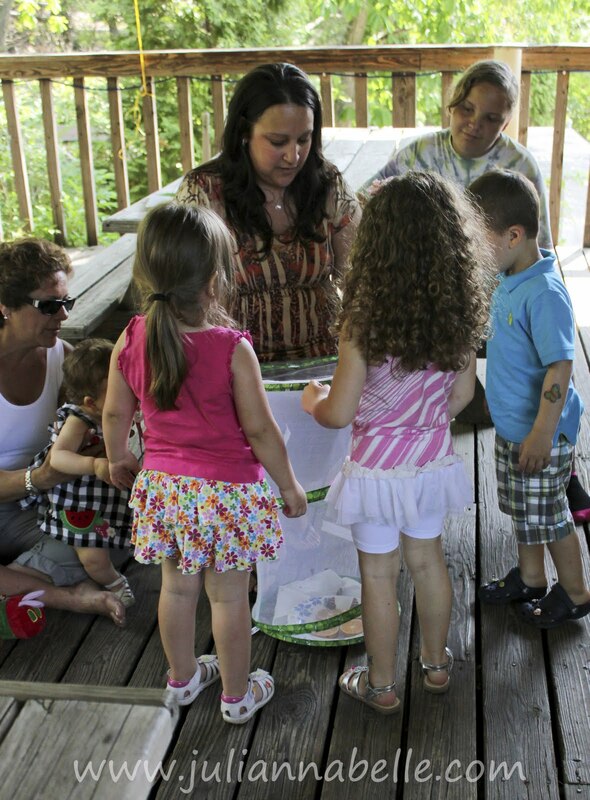 When we were done, we released the butterflies one by one. Some did not go so willingly. I guess they did not want to give up their safe existence and fresh daily oranges. I am happy to report they all made it safely to freedom! 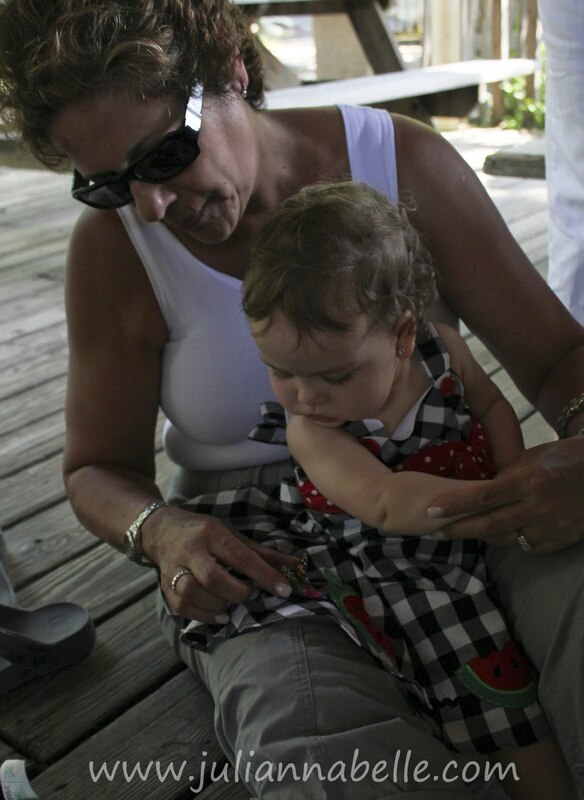 My Aunt trying to get Julianna to hold a butterfly. 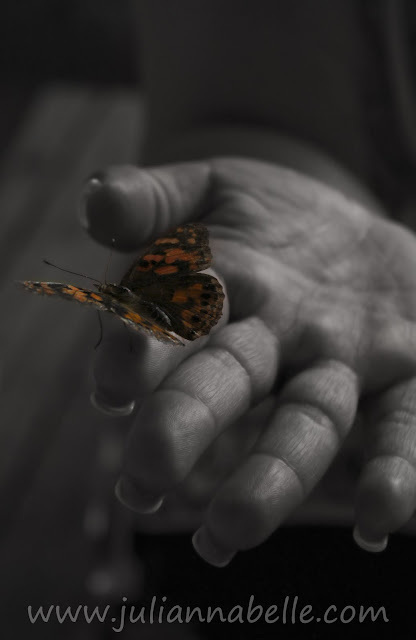 It was probably best that Jules never actually got her hands on the little butterfly or she would have surely ate him or squished him. 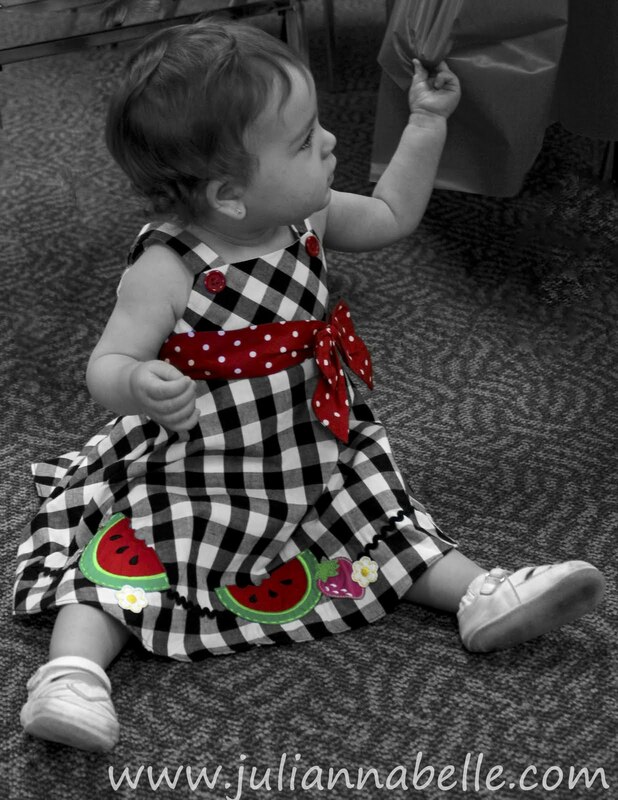 My god-daughter Bianca holding a butterfly. She loved it! Baby Jake trying to grab a butterfly. 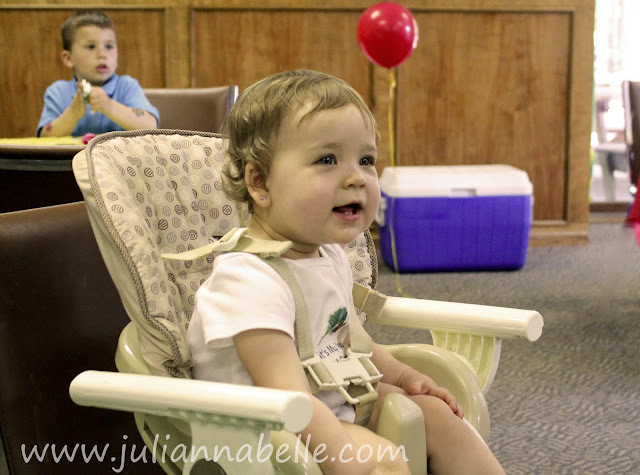 We all sang Happy Birthday to Julianna - she had the funniest look on her face and didn't know what to think of everyone singing to her! I think she liked it! That's it. Like I said, I really should have taken more but ... you get the idea of our special day! I know it's a lot of pictures... and I hope I did not bore you! haha! Love the cake in the nose... so happy the butterflies made it for the big day. You did an amazing job Skye. thank you for sharing. We had fun, Skye. 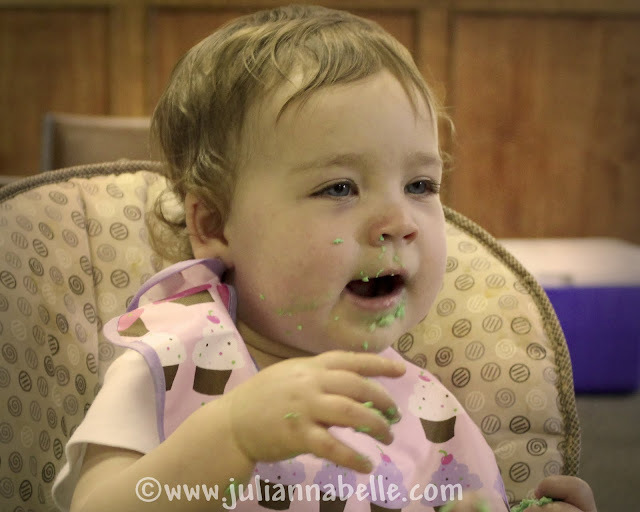 I was so happy to be able to share in Julianna's first birthday celebration. You and Brian did such a wonderful job to set it all up. Great post. You did a great job! Love the cupcake display! Love Julianna's dress. 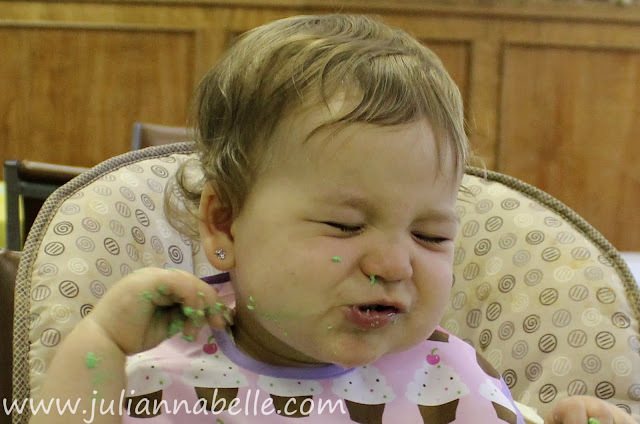 She looked like she had a fun time - she is a pretty, little 1 year old. Looks like a great party! 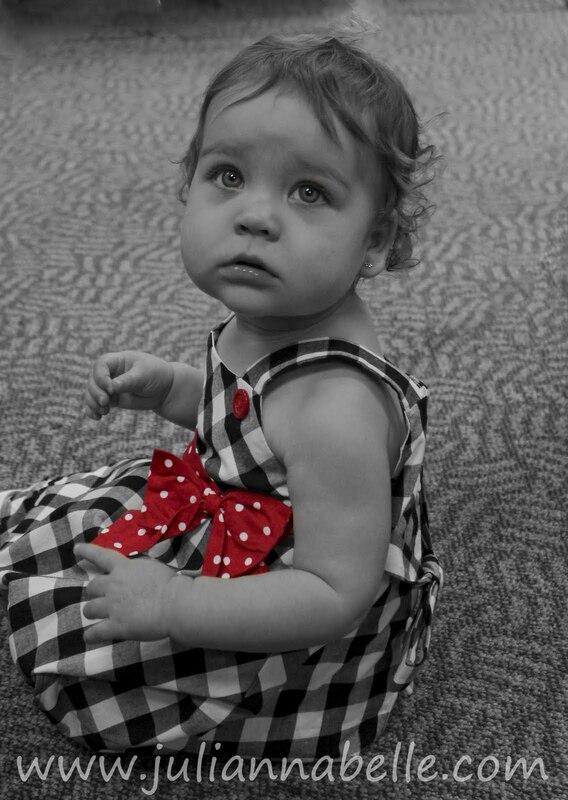 Never bored looking at pictures of that beautiful baby! That looks like so much fun! 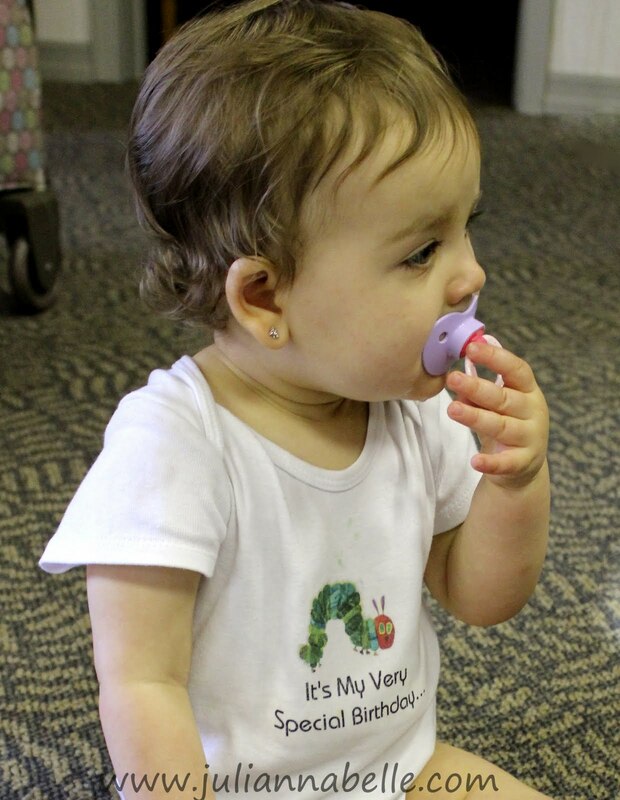 The cupcake caterpillar is so cute, and I love the little onesie you made for her! Releasing the butterflies must have been a ton of fun too! It looks like you guys did a fabulous job! Happy Birthday Julianna! Wonderful job! Beautiful! Everyone looks like they had a great time! Skye , Thank you for the great Blog of the party!! It looks like she had a good time and so did the other children...!!! You and Brian did a great job!! Happy Birthday again Julianna!!! Love all of you and sorry we couldn't be there.. Mrs. G.
It looks like it was perfect! So glad the butterflies lived. Those are cool pictures of them! The onesie is really neat. What a cool idea! I honestly wish I would've thought of this myself! Because I would never steal an idea from another mama... in real life or the blog world :) But seriously. This is my favorite party theme of all time. MOmmysankey - thanks! I was sooo happy the butterflies lived too - at least they got a chance to go out into the world and be free! Yvette/Nana - thanks - we did work hard, and we were of course happy you were there too! Carla - thanks- I won't lie, I borrowed that idea from the internet about the cupcakes ... but I still love the way it turned out! Jenrod - thanks we sure did! Mrs G - Yes sosrry you guys could not be there.... next time! Granthamania - thank you - I really did not want to have her in her dress for her cupcake eating... so I came up with the onsie idea... it was an "Iron-On" Kit from the craft store. WHat a great invention! Oh. My. God! That is some attention to detail! I think you need to send this into a website or magazine or something. It looks like a blast. 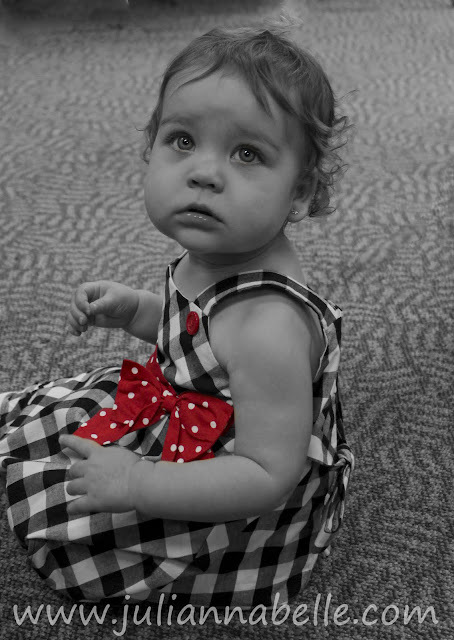 I love the pics of Julianna that are b&w with color added back in. 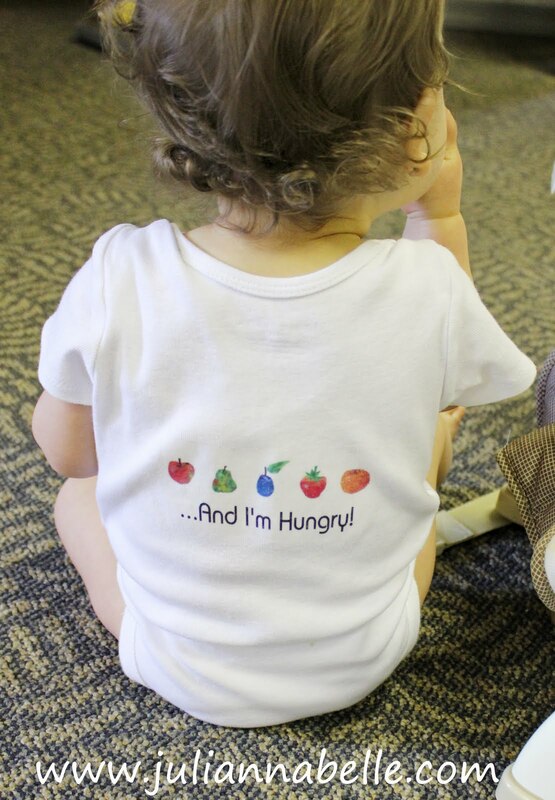 And that onesie is adorable!! Looks like she had a great time :) Everything looks wonderful. Thanks for sharing! Great post! I love the theme. You did a great job with everything!